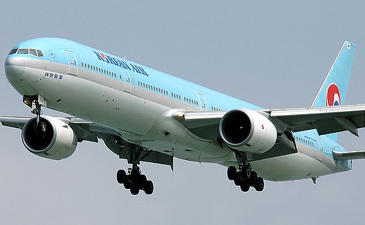 Korean Air Lines Co, South Korea's largest carrier, said it will spend US$10 billion over the next 10 years on ordering new aircraft and upgrading the services and facilities on its fleet. Korean Air will buy 10 of Boeing Co's 787 aircraft to be used on so-called mid-range destinations to the US and Europe, the Seoul-based airline said in an e-mailed statement on Monday. The aircraft, valued at US$1.3 billion, will be delivered over two years starting in 2009. Korean Air is preparing for competition with two low-fare carriers that are beginning services in the country, as well as a high-speed railway service that is taking passengers away from domestic flights. The Korean currency gained 15 percent in 2004 against the US dollar and has risen 2.1 percent this year, making it cheaper for Korean Air to import new aircraft. 'Boeing's 787 airplanes fit well into Korean Air's shuttle services business in Asia,' said Song Jae Hak, an analyst with Woori Investment Securities. Korean Air's Boeing 777-3B5 airliner leaving from Hong Kong's Chek Lap Kok International Airport March 12, 2004. 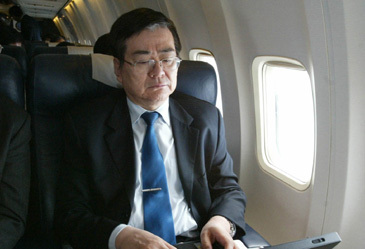 'This airplane deal signifies our commitment to our vision of becoming one of the world's top 10 airlines by 2010,' Korean Air chairman and chief executive Cho Yang Ho said in a statement. The investment 'exemplifies our long-range planning to ensure Korean Air's capabilities to meet future competition and market demand while also being more cost efficient', he added. In addition to acquiring new aircraft, Korean Air plans to upgrade the in-flight entertainment and communications on its planes and other undisclosed facilities. Korean Air posted its first fourth-quarter profit last year in at least five years, as more Koreans travelled overseas. The carrier reported net income of 198 billion won (S$321.3 million) for the three months ended Dec 31, compared with a loss of 183.5 billion won the year earlier.